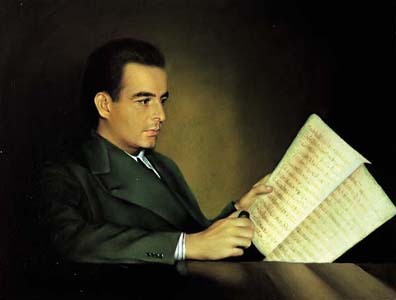 A centenary celebration is in order for one of the greatest of American composers, Samuel Barber (b. March 9, 1910), and yet the scheduled tributes in the country of his birth are few and far between: the Philadelphia Orchestra, for example, which premiered many of Barber’s compositions, has programmed just a handful of works, scattered over the course of their 2009-2010 season. The Austin Symphony Orchestra (ASO), notably an exception, last week presented an all-Barber program under its imaginative music director, Peter Bay. As Maestro Bay correctly stated in his opening remarks, the ASO is very likely the only professional orchestra in the entire United States offering such a concert this season. What’s more, tickets sold very briskly for the two concerts and the audience seemed to enjoy what they heard. It probably didn’t hurt that the dynamic and flamboyant Nadja Salerno-Sonnenberg was the featured soloist. Barber is by no means a ‘difficult’ composer and never was. In fact, he was often accused of being old-fashioned and too conservative to be taken seriously as a composer of contemporary music. While much of his music does indeed have recognizable melody, it is often complex in its musical argument, and there is frequently a deep sadness in his music that can be unsettling. The Adagio for Strings, by far Barber’s best-known composition, has become one of the staples of string orchestra repertoire and is often performed at funerals and occasions of public lament. It is a richly beautiful piece, shot through with anguish, expressing at its climax, a kind of primordial scream. Peter Bay and the ASO played the work with the utmost sensitivity and gave full value to the eloquent rests which are so integral to the work. The concert opened with Medea’s Meditation and Dance of Vengeance Op. 23a, taken from a ballet score written for Martha Graham in 1946. I must confess that I have never really warmed to this piece – it always sounds to me like a second-rate version of the "Dance of the Seven Veils" from Richard Strauss’ opera Salome – but Bay and the ASO played it very well indeed. The Toccata Festiva Op. 36 closed the first half of the concert. Barber composed this piece in 1960 to inaugurate the new organ installed at the Academy of Music in Philadelphia, which, at the time, was the home of the Philadelphia Orchestra. The Toccata remains a largely ceremonial piece to be trotted out on special occasions, such as this. Christoph Eschenbach (with organist Olivier Latry) performed and recorded (Ondine ODE 1094-5) the work at the inauguration of the new organ in Verizon Hall in Philadelphia in 2006. The audience at the Long Center was utterly fascinated watching the stagehands bring on the portable organ console piece by piece and then assemble it onstage. One of the highlights of the Toccata Festiva – apart from the setting up of the organ – is undoubtedly the remarkable cadenza which is almost entirely played on the pedals. This is exciting to watch, especially if the keyboards and pedals are facing the audience, as they were in Austin. The organ soloist was Stephen Hamilton, Minister of Music at the Church of the Holy Trinity in New York City. Nadja-Salerno Sonnenberg “owns” this Concerto! After intermission came the two works which stand for me as among Barber’s greatest achievements: the Violin Concerto (1936) and the Symphony No. 1 (1939). The soloist in the Violin Concerto was Nadja Salerno-Sonnenberg, who has been playing this piece with love and virtuosity for decades. She doesn’t just play this piece; she enters into the soul of it. From the almost inaudible opening bars she seems to be improvising, slowly bringing the music to life before weaving an engrossing tale of beauty and emotion. The first melody at the opening of the concerto is exquisite. The tune first played by the oboist (Ian Davidson) at the beginning of the second movement is even more beguiling. For all its beauty, the last movement of this concerto is problematic for some listeners – especially critics – in that it seems too short and too different from what has come before. But in Salerno-Sonnenberg’s hands it is, as Duke Ellington liked to say, simply “beyond category.” This is a perpetual motion movement in which the soloist’s fingers and bow are a blur from beginning to end. Unique to Salerno-Sonnenberg’s performance is the way in which she so perfectly catches the infectious ‘swing’ of the music. Bay and the ASO were right there for her in all the passionate moments and in the lightning fast and metrically complex finale. And After Intermission…a Performance Worth the Wait! I expected that there would be a rush for the exits after the concerto. In cities famous and not so famous all over the world, listeners tend to head for home after the celebrity guest artist has done his or her thing. As far as I could tell, not a single person left the hall on this occasion. There are some serious music-lovers in Austin and they are not all on Sixth Street! In fact, fleeing patrons would have missed a fine musical experience; the performance of Barber’s Symphony No. 1 nearly topped what had preceded it. The Austin Symphony played superbly and Peter Bay conducted with total mastery of this complex score. There is an achingly beautiful oboe solo in this work too and once again Ian Davidson rose to the occasion. All the music on this concert except for the Toccata Festiva dates from 1936-46. Looking back, this was Barber’s golden period and a gradual decline in productivity and quality set in after that. Depression, alcoholism and a break with his life-long partner Gian Carlo Menotti all contributed to an apparent loss of confidence and energy. Many people admire Barber’s opera Vanessa (1958); I am not one of them. It has always seemed to me somewhat ‘precious’ and lacking in drama. In 1966, Barber wrote another opera, Antony and Cleopatra, on a commission from the Metropolitan Opera. At the time, the consensus was that this was a fiasco and Barber was deeply hurt by the experience. Many of his admirers blamed the excessively grand staging by Zeffirelli for the opera’s failure and it has since been produced elsewhere with some success. This coming March Curtis Opera Theatre will mount a new production at the Kimmel Centre in Philadelphia as part of its year-long celebration of the Barber Centenary. Barber studied at Curtis as a young man and later returned to teach there. For all his ups and downs, Barber created a substantial body of work. Along with Ives, Gershwin, Copland and Bernstein, he has earned the right to be considered one of the major American composers of the Twentieth Century. As we begin to make our way through the second decade of a new century, Peter Bay and the Austin Symphony reminded us of Barber’s stature in a very positive way. Some years ago Nadja Salerno-Sonnenberg made a recording of the Barber Violin Concerto (EMI 54313). She currently leads her own orchestra, the New Century Chamber Orchestra in the Bay Area and with this ensemble she has released an album called Together. For more on NSS visit her website. For more on Samuel Barber, the biography by Barbara Heyman is essential reading: Samuel Barber: the Composer and his Music (Oxford University Press). I recommend also the fine appreciation of Barber in a long essay by Paul Wittke. Barber’s songs are at the heart of his compositional output and it will be a long time before his music finds a better interpreter than Thomas Hampson. The distinguished American baritone has recorded all of Barber’s songs (DG 435 8672) along with soprano Cheryl Studer, pianist John Browning and the Emerson Quartet in a 2-CD set.